Jamie Madrox was dead. Killed by the Terrigen Mists that Black Bolt unleashed on an unsuspecting world, Multiple Man and his duplicates were among the first mutants to succumb to the Inhumans “gift”. But being dead in the four colour universe is, for the most part, merely a temporary inconvenience and sooner or later almost everybody returns for the grave and usually its just a matter of when rather than if, they’ll be back. Most of the time, the whole bringing a much loved character back from the dead thing involves a convoluted and complicated idea that a writer has sweated blood over to prevent fandom rising up in unison, crying foul and clamoring for said writers head to be served up on a silver platter at Comic Con. With Jamie though, it was a little bit easier as the chances are, that a mutant capable of making thousands of copies of himself (or ‘dupes as he refers to them) almost certainly left one locked in a well -stocked, secret laboratory until the whole nasty Terrigen business blew over. That’s entirely plausible, and it’s this idea that Matthew Rosenberg runs with and it not only works, it’s completely in keeping with Madrox and his tendency toward narcissism self-absorption*. 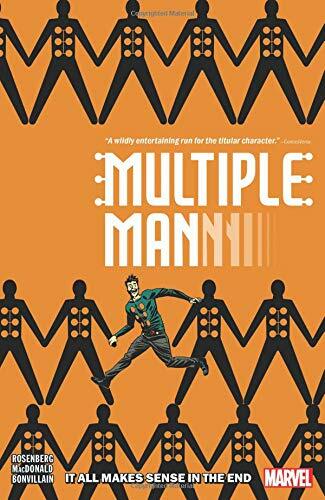 With Multiple Man well and truly back in the land of the living, that’s when things start to get a little crazy in It All Makes Sense in the End. Rosenberg kicks things into high, mind-bending gear in a tale in which Beast’s marvellous magical serums, brain frying time travel and almost paradoxes, altered futures, dictatorial empires, multiple weird versions of the Multiple Man and death, bloodshed, mayhem and carnage** take centre stage. *If you know the character, it’s kind of funny but if you don’t… Oh look, a tumbleweed. ** I know, it sounds like a cheap tag-team based wrestling gimmick from a promotion that’s just venturing into live shows and beginning to cut its teeth. And if it hasn’t already been used and one of you would-be promoters does decide to appropriate it, the least you can do is throw some tickets to the show my way. Or hire me to write your storylines. Either way, you’re welcome.